thanksgiving week is upon us! tom and i have a lot to be thankful for; we have been very blessed in this crazy whirlwind of a year. this thursday, we’ll be thinking of our family in michigan and most definitely missing them. tradition is something that will make me feel a lot closer to family. we’ll be having a brown paper bag turkey, served on a “dump platter”. we’ll watch the macy’s thanksgiving day parade. (hopefully, it is on at a reasonable time in the pst!) most importantly, tom and i will be giving thanks (like we do most every day) for all of our blessings. 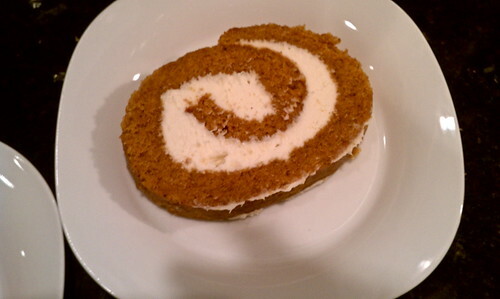 this recipe is for a pumpkin roll, i can’t really think of a specific “traditional” recipe that we made growing up, we usually experimented with new desserts and they always turned out great! this is definitely very thanksgiving-ish. i made it for halloween this year and it’s pretty simple to throw together. it stays nicely in the fridge, so you can make it a day or two before thanksgiving and not think about it until after dinner is over. two very important things that you’ll need for this recipe are a jelly roll pan (measuring 15″ by 10″) and about 1″ deep. i have a non-stick one that works great with this. you will also need a linen-y towel, covered in powdered sugar. 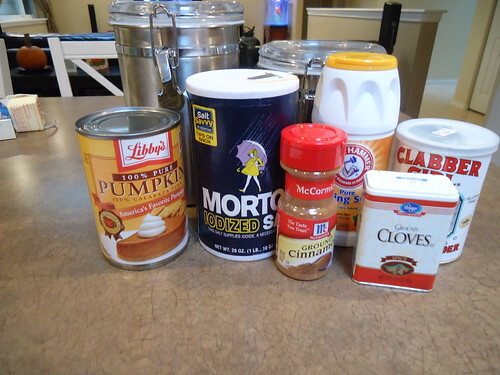 lay towel out on the counter, sprinkle with the 1/4 c powdered sugar. bake for 13-15 minutes or until the top of cake springs back when touched. 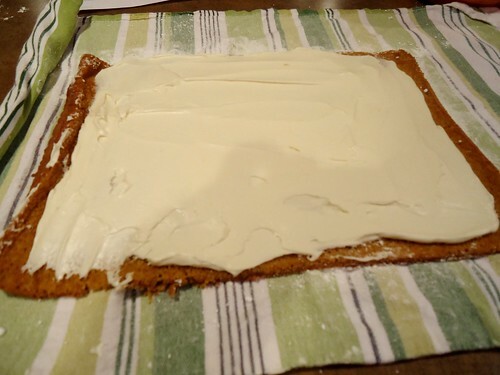 immediately loosen, by running a knife around the edges and turn the cake onto the towel. carefully peel off paper. roll up the cake and towel together, starting at the narrow end. cool on a wire rack. while your cake is cooling, beat cream cheese, powdered sugar, butter and vanilla in a small mixing bowl until smooth. set in fridge to keep cool. re-roll the cake and wrap in plastic wrap. make sure that the ends are secure with twist ties. refrigerate at least one hour. it will be ok in the fridge for a couple of days. sprinkle with powdered sugar before serving, if desired. Your Ol’ Mom likes to put chopped pecans on the cake before you bake it to add the nutty flavor to this awesome dessert favorite! I love the pecans, too! I’ll have to add them next time, I didn’t even think about it last time.